Spring is in full swing and pastel inspiration is everywhere. I've been working on a new collection of affordable wedding guest books in faded pastel shades with hand painted watercolour 'ombre' effect paperback covers with gold leaf which glimmers ever so prettily when caught by light! 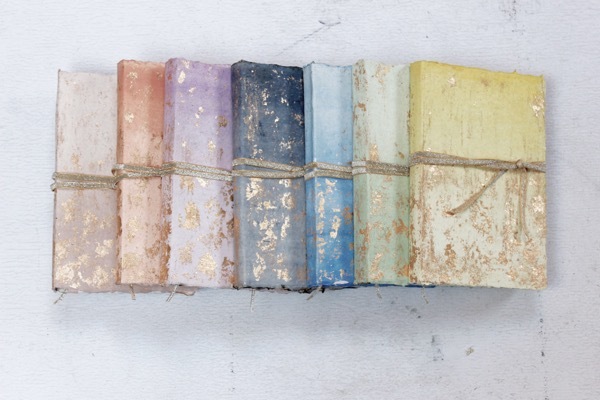 After binding the pages, the fore-edges of each book have been decorated with paint splatters, which lends a playful look to the overall design. A perfect addition to spring/summer weddings or any other special occasion one wants to document. They make great little journals. Each book in this collection is hand bound with 110 gsm eco-friendly recycled paper which is suitable to write, draw or sketch on using most art mediums except alcohol based markers as they may bleed through. Handmade Wedding Vow Books To Giveaway!